There are many professional photographers spend less money on the camera and more on features. Such professional photographers put their camera for sale with less price. This is because they explore all the features and wanted to learn new things from the next level of the camera. But before choosing such cameras for buying, they should pass through some quality checks. In this follow-up on camera buying guide, I would like to share some best suggestions and ideas that you need to consider while buying used cameras. So let's not lose any more time and get started! Here I am going to present the checklist for buying used cameras and lenses. 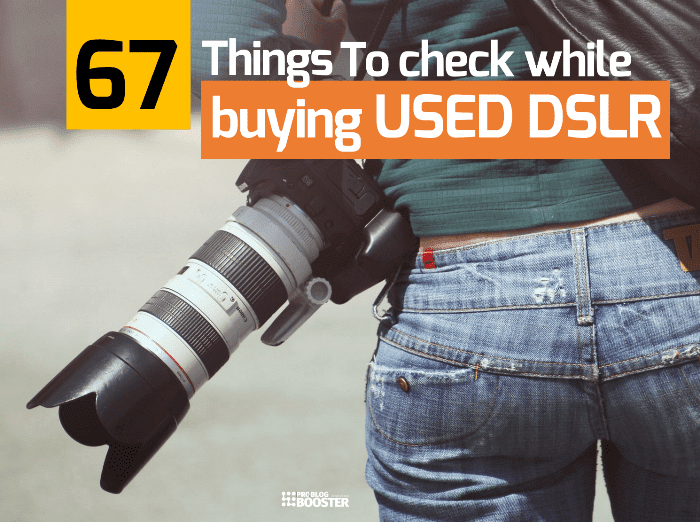 Also, the most essential things that you need to check carefully before buying a used DSLR camera. Say if you don’t have much of photography experience and still wanted to have a DLSR camera, you should go with the used/old DSLR camera first instead of buying totally new DLSR camera. This is because you will come to know about the basics of the camera and its features. Later, you will automatically understand what kind of features or functions you want in your next camera. In this article, I've shared many points which will help you make the right choice while shopping the best DSLR camera. Yesterday I was talking about buying a new DSLR and some quick tips on purchasing the best budget lenses. Points you need to consider while choosing Used/Old DSLR camera based upon your needs. When you are clear about the most important things about what you need to consider while purchasing an OLD DSLR camera, then you'll be able to find the more specific device that fits with your style and you won't end up with the worst camera. Now go through important points to be considered while purchasing an old DLSR camera. 1. Check the entire body and ensure that, no dents, scratches, marks, damages are present anywhere. 2. Check all the buttons, ports, cables, ribbons, cover strips, wheels, sliders etc. and their functions. 3. Check mechanical functions of all the buttons which dismount lens, opens flash, slides LED, removes battery cover etc. 4. Check the panel where the lens is mounted. 5. Check whether any dirt, water spots are not present around the panel. 6. Check whether the lens is mounted correctly. Does it fit perfectly?. 7. Check all the screws on the body to ensure they were not opened/loosen. 8. Check any tags are present over the body like; company logo, numbers, button captions etc. 9. Check the color of the entire body to ensure no any body part is replaced with new one. 10. Shake the camera and listen to any unusual kind of sound is not coming out of it. 11. Dismount major external parts like the lens, battery, card, covers etc. and check the entire camera. 12. Check tripod mount hole it should be in great shape. 13. Check the dial and turn it around to various modes. 14. Look through the viewfinder and ensure that it’s clean. 15. Check whether any dark spots, dead pixels etc. are not present on the viewfinder. 16. Turn viewfinder to bright/dark surfaces and check any internal scratches are not present. 17. Now turn ON the camera and check LED display. 18. Check LED in different angles upward, downward etc. 19. Put the camera on LIVE mode and check any dead pixel is not present. 20. Move the camera and check the movement of the view (like video lagging or flickering) displayed on the LED. 21. Try your own memory card and test the camera with it. 22. Also, try your own lens and test the functions of the camera with it. 23. Check shutter sound while you press and hold the click button. Also, check the speed of the shutter. 24. Check shutter in manual and autofocus. 25. No any unusual sound should be produced by the camera. 26. Check the shutter functions with and without a card inserted. 27. Change shutter speed and click some pictures, it should change the lights and ISO according to the manual changes. 28. Try clicking pictures with Flash ON and OFF. 29. Check whether flap automatically opens when flash is kept ON from settings. 30. Try to click photos with various picture modes from the dial, it should capture pictures according to the selected mode. 31. Check autofocusing of the camera lens. 32. Check sharpness - whether a focused object is clear in viewfinder/on LED too. 33. Try focusing far and close objects and check the shutter sound while focusing. 34. Check whether a camera is focusing on an object where you have pointed. 35. Check the IR (Infrared) functions like a remote control. 36. Now try recording a video of say 50-60 seconds. 37. While video recording, try manual and auto-focusing the view and check the recorded video and the quality. 1. Check the entire lens to ensure no dents, scratches, marks, damages are present anywhere. 2. Check the material of the lens and the grip. 3. Check UV glass in front of the bright/dark surfaces and ensure no any dust or scratches or breaks etc. are present. 4. Check the panel where the lens is mounted to ensure no any mounting/dismounting difficulties are observed. 5. Check whether the lens is fitting properly on the panel. 6. Shake the camera and ensure that there should not be any unusual sound of loose fitting. 7. Check mount/dismount lens pin and its function. 8. Check whether any previous repair jobs are made. 9. Check Autofocus (AF) and Manual focus (MF) slider/button and its function. 10. Set lens to Autofocus (AF) mode, and check lens movements while press and hold click button. 11. Listen to the sound coming out of the shutter while autofocusing. 12. Objects are focusing correctly where you have pointed the lens. 13. Focus on the object should be adjusted automatically as you move the camera. 14. Check the image from viewfinder to ensure no dead pixels or dust or scratches etc. are present. 15. Now set a mode to Manual Focus (MF) and focus on the objects manually through lens. 16. Check whether lens focuses the object correctly in Manual Focus (MF) mode. 17. Click as many as possible pics and check the image quality on computer. 18. Check Macro functions of the lens. 19. If the lens has Image Stabilization feature, check its function. 20. Check the screws to ensure they were not opened/loosen. 1. Check various functions of the camera like ISO, Image quality, Flashes, Exposure, Shutter speed etc. 2. Check all the settings of the camera itself like Timers, Display, Controls, Video modes, Color balance, red-eye detection etc. 4. Check Wi-Fi, GPS, NFC etc. and their functions, connectivity or response. 5. Check card reader slot and try with your own cards. 6. Check flashlight and it luminance/intensity. 7. Check sensors carefully, the best way to do is to check the quality of clicked images on computer. 8. Check cables, ports, any other accessories, battery, charger, battery grip, covers, flaps etc. 9. Ensure any driver CDs are available. 10. Check CD driver functionality. 11. Check IR Remote and camera response. 12. Ensure camera box is available along with any warranty cards, user manual guide etc. I hope above given information will help you make the right choice. If you still have something and wanted to suggest apart from the above points, feel free to use below comment section to get in touch with me anytime. Happy to hear from you and to publish your suggestions to help others.